May. 11, 2013 6:00 a.m. 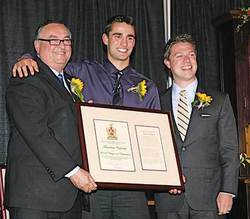 The Youth Award of Merit was presented to Mr. Timurlane Cakmak at the 2012 Citizens Of Distinction Banquet. Upon receiving his award Timulane (center) drew a laugh from the crowd by throwing his arm around Mayor Krischke (on left) just in time for this photo. Leduc is known as a city with a big heart, housing a community always ready to volunteer their time and help to improve this corner of the world. So with all the incredible people to choose from, it's always a wonderful surprise each year to discover which select few are to be honoured with a Citizens Of Distinction Award for their outstanding efforts amongst a field packed with worthy recipients. This year was no exception, with six different individuals and groups receiving the City's highest honour given to a member of the public, who has made a significant contribution to the community. In typical Leduc fashion, the event sold out weeks prior to the banquet with over 600 volunteers sitting in the audience, representing more than 120 different organizations, all gathered to support and cheer on their volunteering colleagues who were being honoured this night. In the spirit of service it was a treat for guests to be seated by all the members of City Council who were wearing fresh corsages and boutonnières of beautiful sunflowers. The meal for the evening, catered by Hat Tricks Restaurant, stayed true to the night's theme of "The Heart Of Our Country", by serving delicious BBQ'd chicken and ribs, corn, and roasted baby potatoes, along with a dessert table overflowing with apple cobbler, caramel sauce and lemon meringue pie. It was not a night to be watching your diet! Mayor Krischke opened the ceremonies by saying "To all the volunteers here tonight; I thank you, the City thanks you, and all the people who benefit from your efforts thank you!" Moving right into the presentations, the first award of the evening was the Environmental Achievement Award presented to Mr. Andrew Tait. Mr. Tait is heavily involved in a large number of environmental boards, steering committees, green initiatives, and has been a guest speaker and educator in children's environmental and science programs. Mr. Tait has also recently authored a book titled "An Introduction To Urban Forestry" that has been submitted for publishing. The second award of the night was the Youth Award of Merit presented to Mr. Timurlane Cakmak. At just 17 years of age Timurlane has already established himself as a leader at local, Provincial and International levels by volunteering in leadership roles with many charitable events and humanitarian initiatives. Timurlane is already a certified yoga and indoor cycling instructor and gives free yoga classes to youth and seniors in the community. He has also earned 25 provincial medals in athletics and maintained an academic average of 90%. Obviously an extrovert, Timurlane got a big laugh from the crowd when he threw his arm around Mayor Krischke's shoulders just in time for the official photographs, and then advised any potential employers in the crowd to seek out his number and give him a call! The Athletic Achievement Award was given to Mr. Brandon Hickey, a young man of just sixteen action packed years who began playing hockey at four years old and "hasn't looked back since!" Brandon has played on numerous gold medal winning hockey teams and was the LJAC Bantam AAA Oil Kings top defenceman for 2010-11. He made Team Alberta for the 2011 Alberta Cup and was then drafted into the WHL. He currently plays for the Spruce Grove Saints in the AJHL and for three years running he was named Athlete of The Year at school. The Leduc Performing Arts and Cultural Foundation's founding members were the recipient of the 2012 Culture and Heritage Recognition Award. Founding member Mr. Ed Moussa accepted the award on the group's behalf saying that he was "extremely humbled" to be accepting this award tonight, and then speaking of when they began the foundation, joked "Thank God we didn't fail!" The founding members; Ed Moussa, Dennis Nosyk, Barb Martinson, Murray Hales, Dixon Ward, Cec Race, Gord Riddell, Paul Mansell, John Jackie, and Mike Slade established the Foundation to provide a framework for the expansion to the Performing Arts Centre, which upon completion became the Maclab Centre for the Performing Arts. Next, the Community Spirit Award was presented to Riseup House, an organization in Leduc that provides ongoing outreach services to women who have experienced all types of intimate partner abuse. Established in 2007 by Executive Director Joanne Van Beek, Riseup has since provided services to over 300 women. In 2012 alone they offered nine different support groups, two five day retreats, 463 counselling sessions, and many different educational presentations and seminars. Joanne accepted the award on behalf of all the staff and volunteers at Riseup. She stated "It's quite and honour to be standing up here receiving this award tonight. We could not have accomplished what we have at Riseup House without volunteers." The final award given this night was the Mayor's Special Award which was presented to Mr. George Lavertu. Mr. Lavertu is probably best known as the former owner of the Leduc Smitty's Restaurant, prior to his retiring almost two years ago. Although many people in the community know who George is, not everyone realizes the huge contributions George has made to this community. Through Smitty's, which he owned for 15 years, he donated generously to uncounted charities and organizations, has served on the Chamber of Commerce Board, the Economic Development Board, and was a member of the local VLT operators group which saved the Alexandra outdoor pool with a donation of $50,000.00. For 22 years Mr. Lavertu sat on the board for the MS Bike Tour Society and for ten years was in charge of all their food donations. He has volunteered with Ducks Unlimited, is a member of the Leduc/Nisku Rotary Club, and is also an Area Ambassador for the EDA. Visibly touched by the honour, Mr. Lavertu's voice was a little shaky as he declared "Leduc is my favourite place!" And proceeded to tell the story of how he came to the community seventeen years ago from Edmonton, figuring it was just a temporary relocation to get his restaurant off the ground, and ended up never leaving. Mr. Lavertu ended his stated appreciation for the award by saying "I love Leduc!" and exited the stage to a loud round of applause. At the conclusion of the award presentations the entertainment kicked into high gear with the Happy Homesteaders Square Dance Club doe-see-doeing their way around the dance floor. Incredibly talented local Celtic/folk fiddler Lizzy Hoyt and her band then took control of the stage and held the audience spellbound with their beautiful mix of classic Irish folk songs and toe tapping jigs for the remainder of the evening.